2. 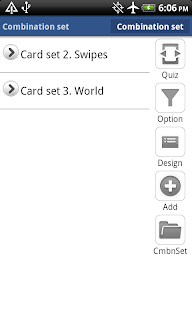 How to create card, card set and combination set? 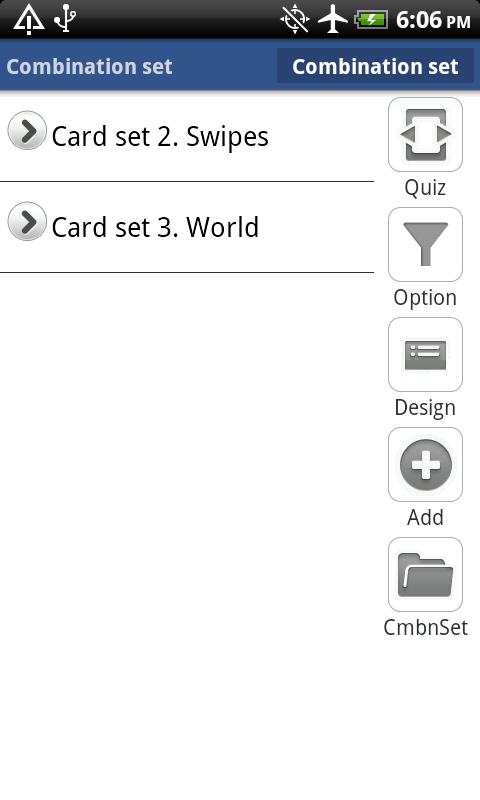 Following is a step-by-step procedure to setup card sets and combination set and to add cards there. The very first you want to do is creating card set. Card set is where you add and browse the cards. Step 2) Press "New" in right side button area. 3. Empty card set - contains cards. 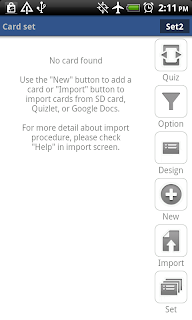 Place where you can add, import, edit cards. 4. Combo set - contains cards sets for combined study. 5. Folder - holds cards sets. can organize the sets in folder hierarchy. Step 3) Please select "Empty Card set". Then you will be in "Card set" screen without any cards. There are two ways to add cards. 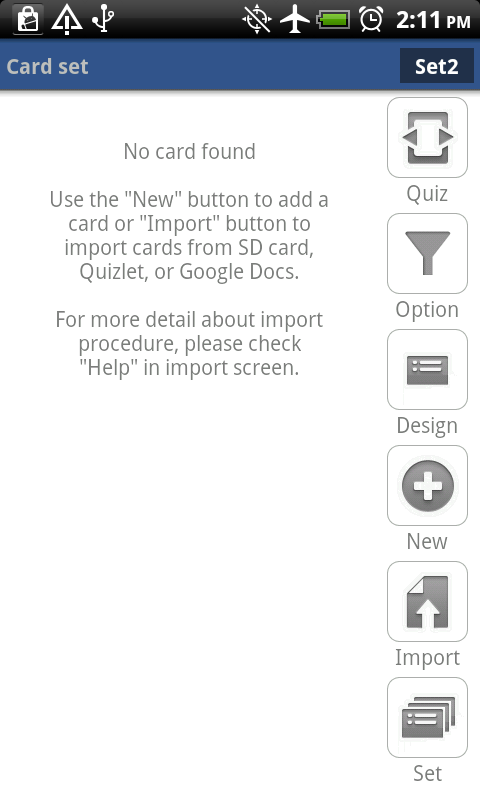 you can either (1) creates cards one by one or (2) import cards from internet/file. For simple testing, we will just manually create two cards and add them in selected card set. Step 4) Press "New" button in right side button area. Then you will see Front side, Back side and Note section fields. Step 5) Enter any card contents and press "Save"
Then you will see "Created" message. Step 6) Now, press "Add new" for the second card. This will empty the fields. Step 7) Enter any card contents and press "Save"
The you will see another "Created" message. Step 8) Press "Close" and go back to "Card set" screen. Now, you see two cards are created for the card set. Now, it's time to test "Combination set". 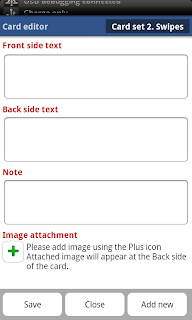 Combination sets are also called folder and where you can put multiple card sets. If you want to browse multiple card sets all together, you definitely use this. There you are given two choices, "Card set" and "Combination set". Step 3) Please select "Combination set". Then you will be in "Combination set" screen without any cards. 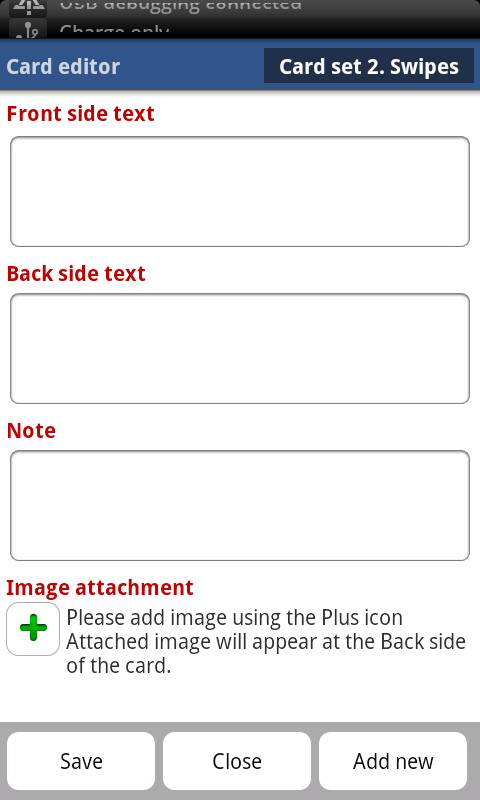 Step 4) Press "Add" button in right side button area. Then you will see all the available cards sets which you can put into current combination set. Step 5) select some of the card sets and press save. Now, your combination set is ready for browse.